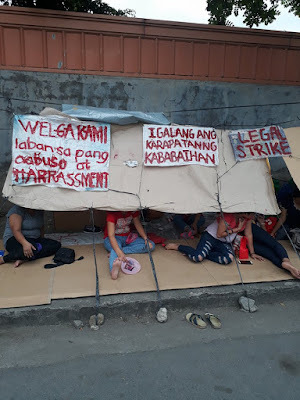 Workers from the Cavite Economic Zone, together with their supporters, staged a rally at the main gate of the zone in protest at the continuing harassment of striking women workers of electronics company Lakepower Converter Inc. Yesterday, there was another incident of ecozone guards trying to prevent strikers from entering the ecozone. Another mediation meeting is scheduled tomorrow between the union and management. The group Partido Manggagawa (PM) also called for the resignation of the head of the Cavite Economic Zone for being responsible for the harassment of striking women workers that resulted in injuries to two strikers and the imposition of “martial law” in the country’s biggest export processing zone. The picket today was the second solidarity action since last Friday. “The violent attacks on women strikers by armed security guards contracted by the Philippine Economic Zone Authority (PEZA) lie squarely in the hands of Atty. Norma Tañag, head of the Cavite ecozone. We demand her resignation,” asserted Rene Magtubo, PM national chair.